In celebration of my post from yesterday, and for general awesomeness everywhere. White, pink and green. This just makes me happy. What is feeling scrapworthy in your world today? SUPPLIES: Adobe Photoshop CS4 • Avenir and Trade Gothic fonts • and nothing else. I love this page Cathy!! The colors are so good together and journaling is great. I was wondering now that Aidan is home with you for the summer is she interested in running with you?? ahhh seeing these colours together again makes me happy also. Pink green and white look great!!! Seriously though, I’m glad that running has given you so much and that, although you don’t like the rest and Xtraining days, you are sensible enough to schedule them for yourself. Go you! Pink and green – reminds me of a certain book cover…lovely page and a very scrap-worthy achievement. What a wonderful accomplishment … definitely scrapworthy! So thrilled for you and your accomplishment. My scrapbworthy event? Today my youngers get out of school and summer holiday for the whole family officially begins at 1:35PM. We are all excited for it to begin! Very motivating. I haven’t pushed myself past 3 miles yet. Thanks for sharing. Dawn, she sort of is. She is in theory. I think she should run. She’s 5’9 and has the longest legs! Yeah, I can’t lie: still my happiest color combo. Johanna, very cool. I love how clean the design is! congrats! Cathy, I see that you are using that fab photo taken at the wedding with the light from heaven shining down on you. I really need 1/10th of your willpower, I hate to exercise. And I thought there was something familiar about it, Shannan reminded me, it’s the same color combo as your book. Really lovely. I remember seeing that TWEET last week and thinking WOW I don’t think she’s gone 5miles before. I am so excited to see you celebrate this accomplishment – good for you!! Definitely Scrapworthy! Wow awesome colors ! i love this page. And your journaling is perfect, I undestand what you mean. i began running one year ago. I gained some muscular and most important I gained self esteem 🙂 Go on Cathy, you are inspiring. Thanks for answering back Cathy. I didn’t realize she was that tall. We are a small to average size family. With long legs she could be a great runner. It would be so cool to see you two running together. Have a great day. Thank you, I feel totally special now! I am really considering to take your inspiration to scrap this as my special event and run with it. I’ll be sure to report back in case this actually happens. I ran my first half marathon on Saturday! I wasn’t sure if I would be able to run the whole thing, but I did 🙂 Isn’t it an awesome feeling when you can go farther than you thought you could? My reward was buying the Nike + iPod sensor yesterday. On to the next race! Love this layout! I just finished my first sprint triathlon this past weekend and can see this layout working for that! Congrats to you and thanks for sharing! I bow to you Heidi. that’s amazing! And have fun with the Nike+! I, too am 5’9″–LOVE what running does to my legs…Tell her to go for it! Cathy, I think you and Jaime Oliver should get together…At least for a little PSA…I love how you are changing the face of a beginning runner…Wish I knew just how many people you have dragged off the couch. 🙂 Go you! LOVE!!!! I know I’ve got a layout (about my new exercise habits) in my head that I need to commit to paper or computer! I love it! Good for you! love it – way to go cathy!! 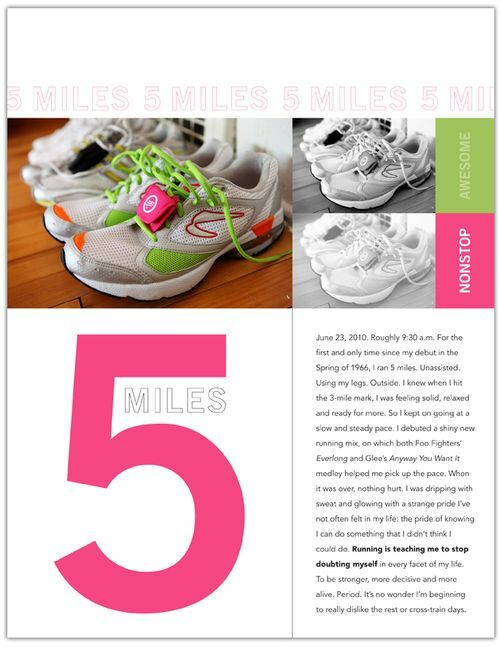 congrats on the 5 miles!!! whoot! loving it that you are documenthing this! Hey Cathy. I am very interested in the Nike running system. I notice, you do not have nike shoes. Does the little ‘pocket’ that you have on your shoe come with the nike set or do I have to hunt for that separately? really, totally, and completely awesome. you’ve inspired me to try 4 miles and I’ve done it twice. Next week I’m going for 5. I love that feeling when you’ve done it and you really didn’t think you could and you have this little celebration at the end of the run. If someone sees you they think you are nuts; but who cares, you did it, you are super awesome and that is all that counts. Love the design – clean and very cool! Wow on the running – I’m still chugging along doing 25 mins (mind you we do have hills) and that feels way plenty. Delighted at your achievement! Congratulations Cathy! What a great page to celebrate your achievement. And the colors are exactly what I’m planning to use to paint an [b]old[/b] closet/cupboard for my daughters’ room. Neat. I bought the pocket at Amazon, and it goes through my laces! Once again, thanks for the inspiration. Where do you look for your inspiration? I love that you wrote that running is teaching you to stop doubting yourself. Healthy body & heart aside, I think THAT, right there, is the best benefit of running, and it is why I wish I could get every woman to run. Thirty minutes or 45 or whatever of telling yourself “you can do this” completely reprograms your internal dialogue i think. At any rate: CONGRATS! If you can run five you might as well start training for a half marathon! Thank you Cathy… will be ordering that up and hope it ‘builds’ my motivation even more..